Samsung is one among the biggest smartphone manufacturer. Its devices are known for their highly advanced features. Samsung also offers a great value for money; you will surely not get any device with such great specifications and reasonable prices, other than Samsung. But, it is a rival of its own. 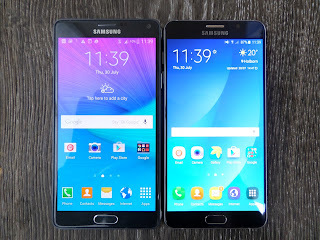 Today we will discuss on Samsung Galaxy Note 4 vs Note 5. Galaxy note 4, as we all know is a brilliant device with some great features and Galaxy Note 5 is yet to come. But, it starts making news even before coming to the market. Let’s take a look on some of the features that are expected to come in an improved version or Galaxy Note 4 or in Galaxy Note 5. Galaxy Note 4 is a fabulous device with 5.7 inches quad HD super AMOLED display. But, Galaxy Note 5 is expected to come with an even bigger screen size and having a 4K resolution. Samsung Galaxy Note 4 comes with a RAM size of 3GB, but galaxy Note 5 has a lot more to offer with an improved 4 GB RAM. Now you can open more applications at a time without facing the problem of your phone slowing down. Samsung Galaxy Note 4 works on Android KitKat 4.4.4 version. Here also you will see a great upgradation because Note 5 will serve you with latest Android M operating system. In Samsung Galaxy Note 4 vs Note 5, the overall look of the new device or Galaxy Note 5 is expected to remain same as the old one or Galaxy Note 4. Since, full specifications of the new device are not disclosed by the company yet. So, it is going to be really interesting to see, what else Samsung has to offer to its customers with a latest device. Undoubtedly, the new device will come with a heavy price tag, but we believe that Samsung will serve its customers with the best. Samsung Galaxy Note 4 vs Note 5, both these smartphones are having some high end features. As Galaxy note 5 features are yet to be disclosed by the company, it would be interesting to see what upgradation Samsung is bringing with its new device. Meantime, check out some of the comparisons done on the basis of rumored Note 5 specifications.